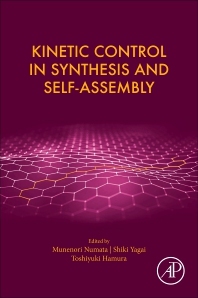 Kinetic Control in Synthesis and Self-Assembly provides a unique overview of the fundamental principles, novel methods and practical applications for researchers across organic synthesis, supramolecular chemistry and materials sciences. The book examines naturally occurring molecular systems in which kinetic processes are more ubiquitous than thermodynamic processes, also exploring the control of reactions and molecular self-assemblies, through kinetic processes, in artificial systems. These methods currently play a crucial role for tuning materials functions. From organic synthesis, to supramolecular assemblies, and from restricted spaces, to material synthesis for hierarchical structures, the book offers valuable coverage for researchers across disciplines. Interesting topics include how to regulate kinetic pathways more precisely, essential molecular design for kinetic traps, and how molecular environments surrounding molecules (i.e., solvent, temperature, and pressure effects) influence kinetic control in reactions and self-assemblies. Munenori Numata was born in Osaka, Japan. He received his B.S. and M.S. degrees in organic synthetic chemistry from Kyoto Institute of Technology in the group of Prof. Akira Oku, and his Ph.D. degree in supramolecular chemistry from Kyushu University under the direction of Prof. Seiji Shinkai (2000). After postdoctoral work with Prof. Kazuhisa Hiratani at the National Institute of Advanced Industrial Science and Technology (AIST), Tsukuba, he joined the JST SORST project at Kyushu University, led by Prof. Shinkai, acting as a group leader from 2002 to 2007. He then became an associate professor at Ritsumeikan University in the group of Prof. Hitoshi Tamiaki, and began his independent career at Kyoto Prefectural University in 2008. His current research interests focus on the development of self-assembling systems far from equilibrium, understanding their scientific principles and developing practical applications. Shiki Yagai was born in 1975 in Yamanashi, Japan. He studied on self-aggregation of synthetic chlorophylls under the guidance of Prof. Hitoshi Tamiaki at Ritsumeikan University and received his PhD in 2002. Then he directly became an assistant professor of Chiba University, and became an associate professor in 2010. During 2006-2009, he pursued self-organized dye assemblies as a PRESTO researcher of Japan Science and Technology Agency. In July 2017, he became a full professor of the Institute for Global Prominent Research (IGPR), Chiba University. His research interests include supramolecular polymers, gels and liquid crystals of functional dyes and π-conjugated systems, photoresponsive molecular assemblies, organic solar cells and mechanochromic luminescence materials. Toshiyuki Hamura was born in 1972 in Kanagawa, Japan. He studied new synthetic methods by using novel strained molecules under the guidance of Prof. Keisuke Suzuki at Keio University (1995–1998) and Tokyo Institute of Technology (1998–2000). Then he directly became an assistant professor of Tokyo Institute of Technology (2000–2008). From 2007-2011, he pursued build-up syntheses of novel π-conjugated molecules as a PRESTO researcher of the Japan Science and Technology Agency. In 2008, he became an associate professor of Kwansei Gakuin University, and a full professor in 2013. His research interests center on the development of new reactive intermediate for construction of highly condensed aromatic compounds and structurally attractive molecules, and their application to organic electronics materials.